Here is a list of the sections on this site; something for everyone. Other sites - links to other sites with free Access tips. Roger Carlson, RogerCarlson.com, has collected a group of Access databases that demonstrate different functions. The Library includes tutorials and a good list of files that can be downloaded. When you are putting a database together you often want to switch between views of Access objects to see the changes. For instance, you'll switch the view to examine a Table in Design view and then back to data view. It is can be faster to switch between views using keyboard shortcuts, rather than the View menu. These shortcuts can be used with tables, queries, forms, reports, and data access pages. While a few of us may be guilty of constructing databases on the run, and then trying to clean up the mess later, the wise ones plan ahead. What information will you need in the future? What reports are going to be requested? If you're the bean counter, do you need to count all the legumes? "Data modeling is probably the most labor intensive and time consuming part of the development process. Why bother especially if you are pressed for time? A common response by practitioners who write on the subject is that you should no more build a database without a model than you should build a house without blueprints. The goal of the data model is to make sure that the all data objects required by the database are completely and accurately represented. Because the data model uses easily understood notations and natural language, it can be reviewed and verified as correct by the end-users. The data model is also detailed enough to be used by the database developers to use as a "blueprint" for building the physical database. The information contained in the data model will be used to define the relational tables, primary and foreign keys, stored procedures, and triggers. A poorly designed database will require more time in the long-term. Without careful planning you may create a database that omits data required to create critical reports, produces results that are incorrect or inconsistent, and is unable to accommodate changes in the user's requirements." Here is an understandable article about how to put together a normalized database. One topic covered is what should be used for a Primary or foreign key. It is possible to define multiple fields as the key fields of a table, but a single field is preferable. ...Far better to have a CustomerID number than a combination of other fields to define a customer. Access offers an AutoNumber field that is a Long Integer which is ideal for key fields. 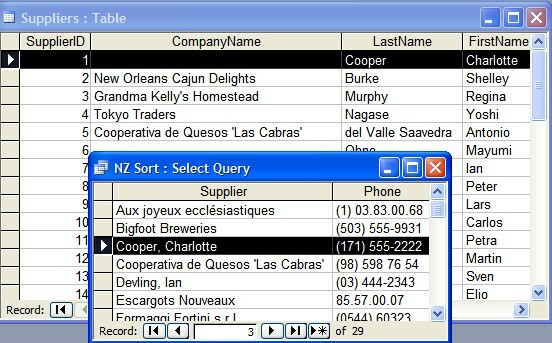 These values are automatically unique for each record and supports multi-user data entry as well. A key field should not change over time. Once identified, like a social security number, it should never change. To ensure a key field doesnâ€™t change over time, it should have no meaning and therefore no reason to change over time. To transfer data from an Access query or table in another Office program, such as Word, there's no need to manually export the data. You can also select a whole table, go to Edit>Copy. Switch to Word or Excel and Paste. It works in the other direction too. Select some Excel data. Switch to Access. While viewing the Tables Objects, Paste the Excel data. It will form a new table. Here is a forum populated by Access users and developers around the world. 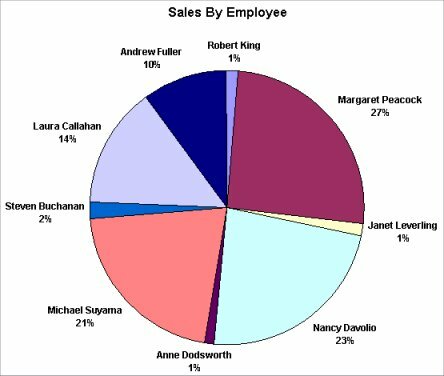 A pie chart displays the per cent of the whole is represented by the component elements. Four salesmen, four slices of pie. The article uses MS Graph in Access, but the techniques are applicable in all the other applications that can use graphs. Easy as Pie. 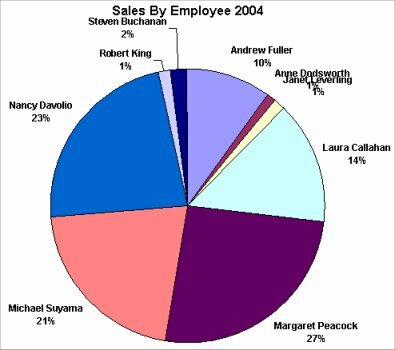 . .
"Chris Weber provides you with a generic method to control the data for pie charts that are actually readable." About.com has information about every human endeavor. "If you're searching for a more flexible data management system, a database might be just the salvation you're looking for. What is a database? Quite simply, it's an organized collection of data. A database management system (DBMS) such as Access, FileMaker Pro, Oracle or SQL Server provides you with the software tools you need to organize that data in a flexible manner. It includes facilities to add, modify or delete data from the database, ask questions (or queries) about the data stored in the database and produce reports summarizing selected contents. Microsoft Access provides users with one of the simplest and most flexible DBMS solutions on the market today. Regular users of Microsoft products will enjoy the familiar Windows "look and feel" as well as the tight integration with other Microsoft Office family products. Read this article closely. If you work in a situation where you need to work with legacy (pre-2007) files, it may be handy. If you do most of your work in 2007, I wouldn't bother. "When you use Windows Explorer or the desktop to create a new 2007 Microsoft Office file, a new Office file is created in an XML file format (.dox or .xlsx). For example, this behavior occurs when you right-click the desktop, you point to New, and then you click Microsoft Office Word Document. By default, files that you create in the 2007 Office system are in XML file formats. This article is about how to create legacy Office files, such as .doc files, .xls files, .ppt files, or .mdb files in the 2007 Office system. You can create legacy Office files without opening any Office applications. To do this, you must modify some settings. The modified settings will apply to all the users who log on to the computer." Access 2003 added another security feature - slash - PIA. Jet 4.0 has had a protective mode in the past, but Access 2003 takes it seriously. A "sandbox" allows the kids to play in a confined area. They can't get into as much trouble as when they are allowed to run around the park. "To help enhance the security of your data, you have the option of running Access 2003 in sandbox mode. In sandbox mode, Access evaluates only those expressions in field properties and controls that are safe. An expression is considered safe if it does not use functions or properties that could be exploited by malicious users to access drives, files, or other resources for which they do not have authorization. 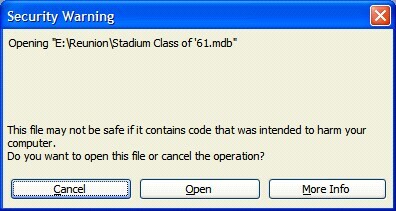 For example, functions such as Kill and Shell could be used to damage data and files on a computer, so they are not considered safe. Sandbox mode is implemented by using the Microsoft Jet Expression Service to evaluate expressions. Microsoft Jet 4.0 Service Pack 8 (SP8) or later allows Access to be fully functional, yet still have Jet block unsafe expressions by enabling sandbox mode. However, the Jet expression service is not part of Access. 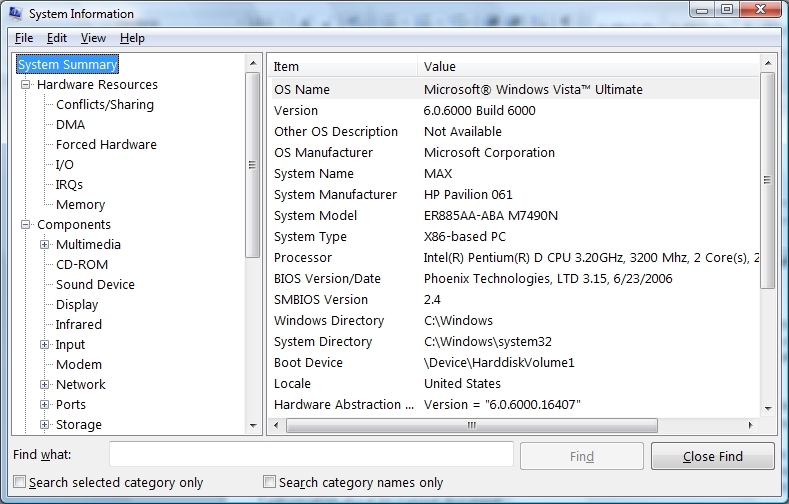 You need to download and install Microsoft Jet 4.0 Service Pack 8 (SP8) or later before you can enable sandbox mode. " You will see this box if your computer does not have Microsoft Jet 4.0 Service Pack 8 (SP8) or later installed, and/or sandbox mode has not yet been enabled on your computer. 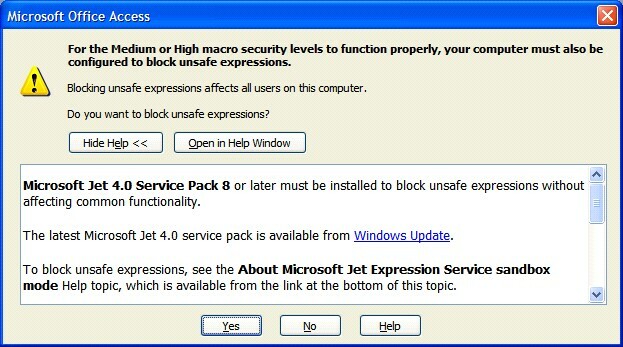 Installing the latest Jet service pack does not automatically turn on sandbox mode and block unsafe expressions. You need to click Yes in the message box to complete the process of enabling sandbox mode. If you enable sandbox mode without installing Jet 4.0 SP 8 or later, certain features will not work. For example, wizards will not start, and instead, you will see the message "This feature isn't installed, or has been disabled". You may also see this warning. Access cannot verify that the file is from a trusted source and that it has not been tampered with since you received it or last worked on it. You can avoid this bother by digitally signing your file or reducing security to the Low level. This effectively puts Access back on the playground. "Unless yours is a stand-alone computer (not part of a network), and you don't ever connect to the Internet, and no one ever has physical access to your computer, or your databases and other files are protected with strong passwords, you should not even consider setting the macro security level to Low." There is another way to do this. Via registery key. 2007 has fewer warning messages. Earlier versions of Access forced you to deal with a variety of alert messages - macro security and sandbox mode, just to name two. 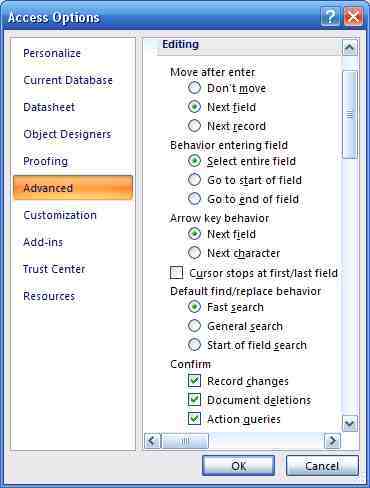 By default, if you open an Office Access 2007 database outside of a trusted location, you see a single tool called the Message Bar. WOPR.com has a great lounge with members who can answer most any question you can come up with. Steve Hayward prepared a couple of Access papers that contain vital information about databases. Not everyone has Access installed on his or her machine. Access is not the most versatile instrument for complex formatting. If you wish to share your findings, Access does have the ability to re-format Reports into Word documents. Open the Report in Access and go to Tools>Office Links. One of the choices is to "Publish It with Microsoft Word." 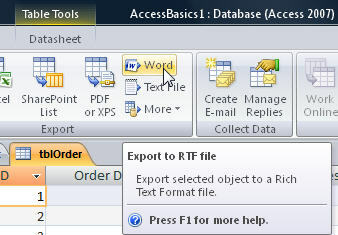 When the data is sent to Word, you will be asked to confirm that you wish to convert the file to "Rich Text Format (RTF)" Click OK. Sometimes, you may not want to go to the effort of creating a report; you just need a quick hardcopy of data. In such cases, you can simply print the Form view of your data. However, doing so also prints the background and shading associated with the form. If you just need a quick data reference, you probably don't want to waste the resources and time to print such a detailed view. 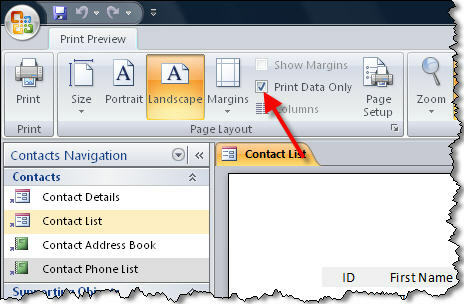 Fortunately, Access has a feature that lets you quickly print just the data from a form or report. To do so, view the data you want to print in the form or report. Then, choose Office button>Print>Print Preview (File >Page Setup) select the Print Data Only check box and click OK. Doing so hides any graphics, lines, control borders, and label controls so that the print out simply contains data. Great news, you can now redistribute and use the PDF and XPS add-in with your Runtime solution. The Runtime's code has not been changed. Your existing runtime solutions can now officially be distributed with the PDF and XPS add-in by chaining the .msi for PDF and XPS into your install process for your app (after the Runtime). Access does not provide much room to enter long expressions in queries, forms, or reports. You can drag the column wider, but there is a neater, quicker method. With the insertion point in the field, hit: SHIFT+F2. A Zoom box opens. Enter the formula and hit OK.
BTW: If you enter Field names in the Zoom box without square brackets. If the fields are recognized, Access will add the brackets. When you're documenting your database applications, you may want to include the same visual diagram of your table relationships that's available through the Relationships window. In Access 2000 thru 2003, this is easy. Simply display the Relationships window as usual and then choose File>Print Relationships from the menu bar. Doing so displays a report preview that you can then print or save. 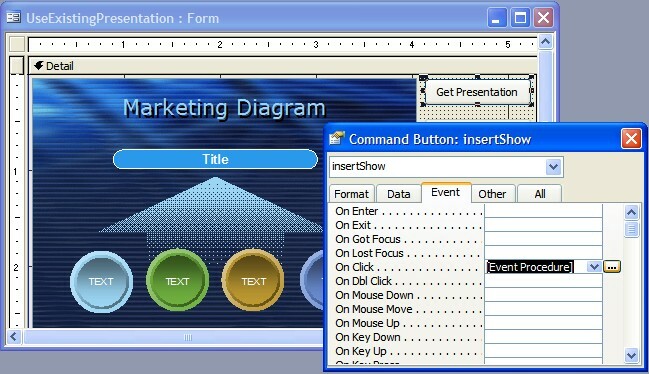 In 2007, to just print out a report, find Database tools on the Ribbon and click on Database Documenter. 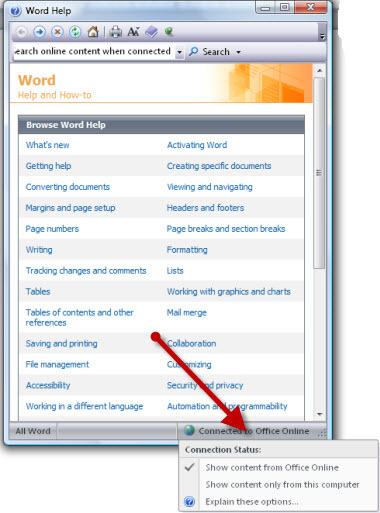 "This article shows you how to customize the way that Microsoft Office Access 2007 starts by adding switches and parameters to the startup command. For example, you can have Office Access 2007 open a specific file or run a specific macro when it starts." Word, Access, Publisher , Outlook, PowerPoint, InfoPath , Excel, Visio, OneNote, FrontPage/Expression, and Project. You don't need to keep all of your data in one file. You can split your MDB file into data and application files. "Even if all your data is in Access itself, consider using linked tables. Store all the data tables in one MDB file - the data file - and the remaining objects (queries, forms, reports, macros, and modules) in a second MDB - the application file. In multi-user situations, each user receives a local copy of the application file, linked to the tables in the single remote data file." Maintenance: To update the program, just replace the application file. Since the data is in a separate file, no data is overwritten. Network Traffic: Loading the entire application (forms, controls, code, etc)across the network increases traffic making your interface slower. Static look-up data such as postal codes might be kept in its own file. Linked temporary tables might avoid the need to compact the application file. On the Database Tools tab, in the Move Data group, click Access Database. In the Database Splitter dialog box, click Split Database. 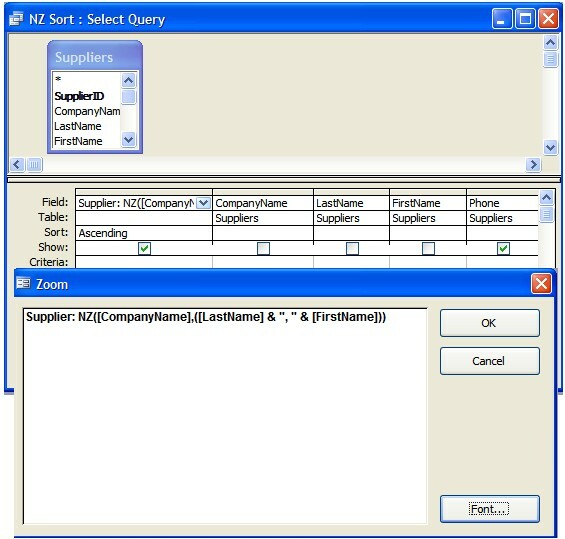 Type a name for the back-end database, and then click Split. "When you import data into Microsoft Access, trailing zeros may be lost. This will happen when you import data that is formatted to show these zeros, but where the zeros are not actually part of the data. For example, in a Microsoft Excel workbook, you can format the number 1234 so that it will be displayed as 1234.000. When you import this workbook into a Microsoft Access table, the number will be displayed as 1234. 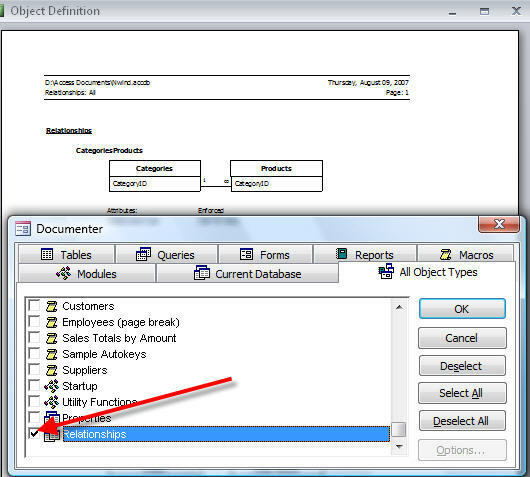 This article shows you how to preserve trailing zeros when you import data into Microsoft Access." When you're working in Datasheet View, you can easily hide columns containing data that you don't need to immediately work with. To do so, select any field in the column and choose Format >Hide Columns from the menu bar. As an alternative, right- click on the column's field name and select Hide Columns from the shortcut menu. To redisplay hidden columns, select Format>Unhide Columns from the menu bar. Then, select the check boxes next to the field names of any columns you want displayed and click OK.
You can select the Unhide Columns command even if no columns are hidden, allowing you to easily hide multiple columns by clearing the appropriate check boxes. "And it came to pass that the cries and lamentations of the Access newbies were heard on high by the gods of the Database, and their hearts were moved to pity for their followers. And they opened their mouths and spake, saying: "Nevermore shall the young and innocent wander witless on their journeys! Thou shalt design normalized tables and understand thy fields and relationships before thou dost begin. Thou shalt never allow thy users to see or edit tables directly, but only through forms and thou shalt abhor the use of "Lookup Fields" which art the creation of the Evil One. Thou shalt choose a naming convention and abide by its wisdom and never allow spaces in thy names. Thou shalt write comments in your procedures and explain each variable. Thou shalt understand error handling and use it faithfully in all thy procedures. Thus spake the gods of the Database, and blessed be their names!"